Are you wondering exactly how you can use strengths like Love, Humor or Zest in your job? If you’re like the many people I teach or coach who have taken the VIA Survey chances are that while you loved getting your results you were left a little confused about how you could use your character strengths at work. 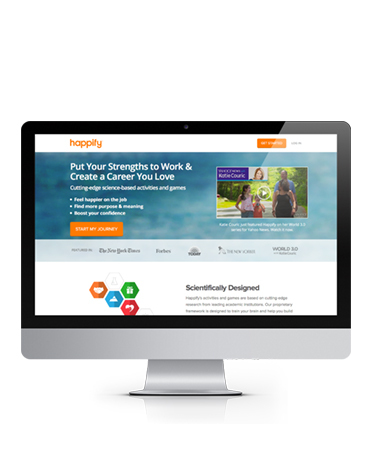 That’s why we partnered with Happify to create this do-it-yourself training track to give you a step-by-step process to help you feel more engaged, energized, and confident at work. Based on my bestselling book, Your Strengths Blueprint: How to Be Engaged, Energized, and Happy at Work, this self-paced, online learning track has been designed for you to do alone, to share with your entire team or use as part of your people management processes across an entire workplace. Discover when you’re already using your strengths well and when you’re overplaying them and underplaying them at work. This is the key to using your strengths in intelligent ways so they help, rather than hinder, the career you want to create. Design a development plan that provides the on-the-job learning, coaching and training opportunities you really need to unleash your potential. Create a practical, busy-proof plan for putting your strengths to work each day, no matter what your description is. Four online training modules that include research-based insights for developing your strengths at work. Interactive exercises and games, to help you create your step-by-step personal strengths plan. 12-months of access to the program, so you have plenty of time to complete the training and can set your own pace. 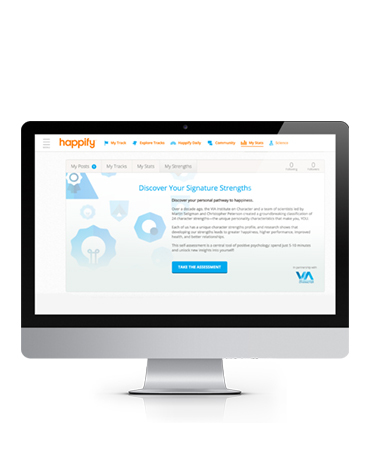 Access to Happify’s award winning training platform for delivery of this learning track (this is a standalone module, and does not unlock other Happify products). You can purchase this program for individual use by clicking the “Add To Cart” button above. Discounts are available for multiple users – get in touch with us to let us know what you need.